Cornish Gillyflower originates from the county of Cornwall. It was discovered in the early 19th century and quickly established a reputation as one of the highest quality apples available in Victorian England. In the words of Victorian pomologist Robert Hogg it is "remarkable for its rich and aromatic flavour". 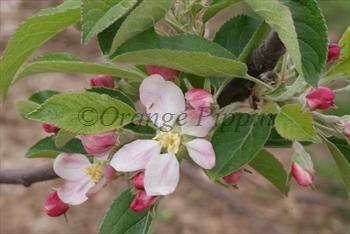 Please fill in the details below and we will let you know when Cornish Gilliflower apple trees are back in stock. Cornish Gilliflower is in flowering group 4. Cornish Gilliflower is self-sterile and needs to be pollinated by another tree of a different variety nearby. Cornwall experiences mild winters and summers which are warm but not necessarily hot. Cornish Gillyflower has some natural resistance to scab, a disease which likes these conditions. It is a moderately vigorous tree, fairly easy to grow although not especially heavy-cropping. 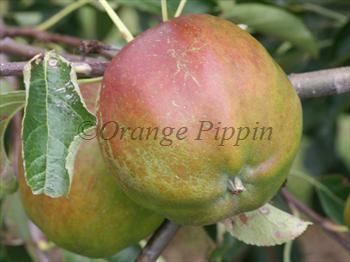 It is slightly unusual in being a tip-bearer - the apples are borne on the ends of the previous year's shoots. It is therefore best to keep pruning to a minimum to avoid pruning off next season's fruit buds. Discovered by Sir Christopher Hawkins near the town of Truro, Cornwall, England and introduced in 1813. The word "gillyflower" or "gilliflower" or "July flower" are corruptions of the French word "girofle" meaning cloves - a reference to the clove-like scent of the blossom of this apple variety.